We all need a little R&R once in a while, and in honour of World Mental Health Day we're sharing our most relaxing beach and city destinations to help banish lifes little stresses. Browse our round-up of gorgeous resorts including laid-back islands like Kefalonia and Gozo, or why not go the extra mile for a more exotic stay in the Caribbean, with Mexico and the Dominican Republic? Our low cost last minute deals are also on hand for when you feel you need to escape (both mentally and physically), while our all inclusive options mean you can lap up the luxury without spending more. The Greek Islands are peppered with pretty beach resorts that make for gorgeous getaways in the sunshine. While popular resorts including Mykonos and Santorini are at the top of the relaxing holidays must-visit list, Kefalonia is a hidden gem that shouldn't be overlooked. Tranquil beaches, spectacular vistas and exellent eateries are what you can expect to find on this island and all of the main attractions are within day-tripping distance. Myrtos Bay (made famous by Captain Corelli's Mandolin) is a postcard-picture stretch lapped by piercing blue sea and steep limestone cliffs, and should be the first thing you tick off your list. Kefalonia's southeastern resort, Skala, is also a hot spot thanks it its long beaches and lively nightlife. Just when you thought it couldn't get any better, you can visit this idyllic island (among others in Greece) for less than £200pp. Dominican Republic relaxing beach holidays are ideal if you're after all inclusive hotels and luxury beachfront resorts, making it an easy choice for relaxing couples holidays in the Caribbean. For a long haul holiday that boasts a 5-star feel, you'll find some of the best spa hotels around in the Dom Rep, including Dreams La Romana Resort & Spa, so you can unwind with a soothing massage or aromatic petal bath as you overlook the beach. Stay in well-known resorts such as Puerto Plata, Punta Cana and La Romana, where you can leisurely explore the island's culture and colonial towns is ideal for those seeking relaxing holidays. One of the ever-popular Balearic Islands, Menorca holidays are an ideal choice for cheap relaxing holidays for families and couples alike - especially as the island boasts so many picturesque beachfront villages and coves away from the bustling tourist areas. Unwind on a secluded stretch of sand at Cala Presili's tiny cove beach - it's certainly worth a trip with vibrant blue waters to paddle in. Nature lovers can lace up their walking boots and explore the lagoons and marshes at S'albufera Des Grau. As the sun sets you can appreciate the island's sleepy villages, coastal towns and spectacular landscape - and thanks to a stress-free flight of under 3 hours, it's easy to jet away to one of the many relaxing beach holidays the island offers. Unlike some other Mediterranean islands, Menora is more geared towards families rather than party people, so you’ll easily be able to find quiet holidays aplenty on the island. If you're whisking the family away, we've found the best Menorca hotels for kids. If you fancy a dose of long haul luxury, this popular resort in Mexico is a Caribbean paradise. You can plan relaxing beach holidays for couples all-year-round thanks to Cancun's spectacular climate, which is made even better by the gorgeous stretch of sand lining the upbeat Hotel Zone - one of the best places to stay in Cancun. Those looking for quiet holidays can easily find a little bit of tranquillity in the town as well. Holidays to Mexico are great if you want to experience a little bit of everything, with a blend of rich history, powder-soft sands, lush forest interiors and all-round entertainment. If you can drag yourself away from the beach, Tulum is a 90-minute drive away and is known as one of the best-preserved coastal sites to wander around. Take luxury to the next level at Moon Palace Cancun, a fantastic 5-star hotel complete with a private beach, sumptuous spa facilties and the largest swimming pool in Cancun! Dubrovnik boasts oodles of historic charm that begs to be explored. If your idea of relaxing is exploring a beautiful coastal city and mixing beach action with a spot of island hopping, then this is the place to be. The gorgeous Croatian islands are ideal for relaxing beach holidays, with hidden beaches around every corner. Croatia holidays are also popular thanks to the country's breathtaking national parks, including Plitvice and Paklenica – or hire a sailing boat and take to the seas for an afternoon. The weather in Dubronik is best during the shoulder seasons of May, June, September and October, making it a great destination to visit whether you wander the medieval town or bask on the beaches. Despite the Game of Thrones vibes (many scene from the hit series are filmed in Dubrovnik), it’s easy to find quiet holidays by simply walking five minutes out of the old town. For chilled island vibes, Malta holidays will tick all the boxes. Gozo is Malta's gorgeous sister island and can be easily accessed via boat trips leaving daily from the port - even sleepier than its neighbours, the island has a great little town with beautiful restaurants and top-notch views to match. Gozo can only be reached from Malta via boat or helicopter, adding a touch of luxury to the island hop - if we say so ourselves! Hotel Pergola Club and Spa will make for a serene stay amid the hills of Mellieha - and don't forget to drop into the Da Vinci Spa! Malta is an ideal holiday destination for the over 50s too, so if you're looking for quiet holidays or an adventure holiday then this island should be on your list! 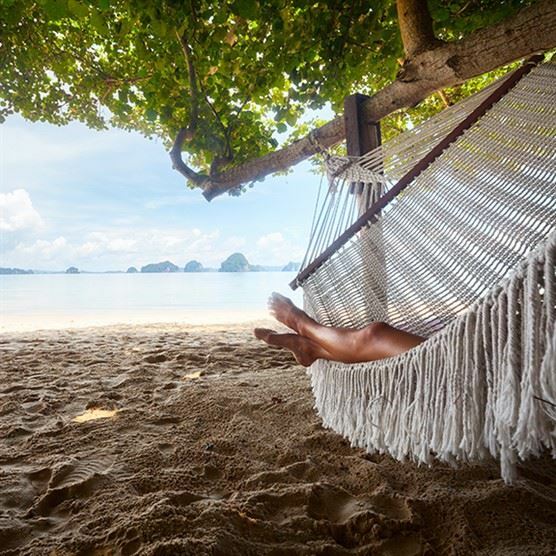 What better way to unwind than by sinking into the exotic palm-lined sands of Thailand and its idyllic islands? This dreamy destination in southeast Asia serves up some of the most spectacular beaches in the world, with crystal clear waters, cultural sights and tropical forests to match. Unsurprisingly, relaxing beach holidays are easy to find in this South-East-Asian gem! Lap up the luxury in Phuket, with a variety of all inclusive hotels fringing endless swathes of powder-soft sand, explore the colourful reefs in the quaint diving capital of Koh Tao, sit back with a tropical cocktail and relax in Koh Phi Phi’s beach bars or unwind with a traditional Thai massage. Plus, you simply can't pass up the opportunity to trek through the islands lush forests on an elephant tour - it's one of the top 10 places to see elephants around the world! Wherever you decide to go in Thailand, you’ll experience ultimate paradise!